Fairy Stars 1 Badge in white with a background of blue stars, green stars, pink stars & yellow stars. Also features a really cute fairy illustration wearing a green dress with blue wings & carrying a super cute yellow star magic wand. These badges are super cute & so popular. We have a great range of pixie badges and fairy badges available along with badges inspired by fairytales & children's books. 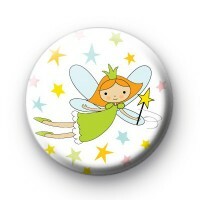 Be sure to browse our categories for more fairy badges. 25mm badge made in our workshop.